It is hot, Hot, HOT in Charleston, SC today. The heat index should be about 110 F around noon today so painting on the the plane started at 6:30 am since the shop doors need to be open for ventilation. 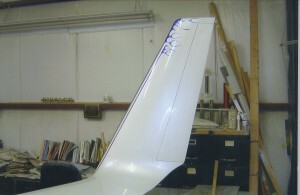 The ADS-B antenna installed on the bottom of the plane. I like the way it looks between the gear legs. A hanging male appendage. 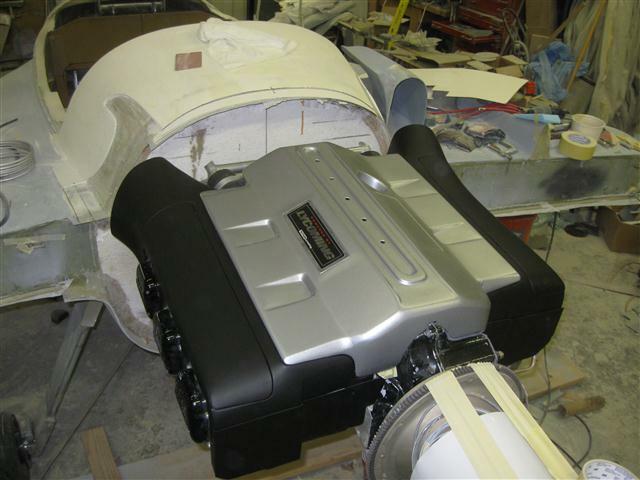 Not as big as the one on my plane (the engine air intake), but for this plane its approprate and will get the job done. You can see the cooper foil in the hell hole I used immediately above the antenna. 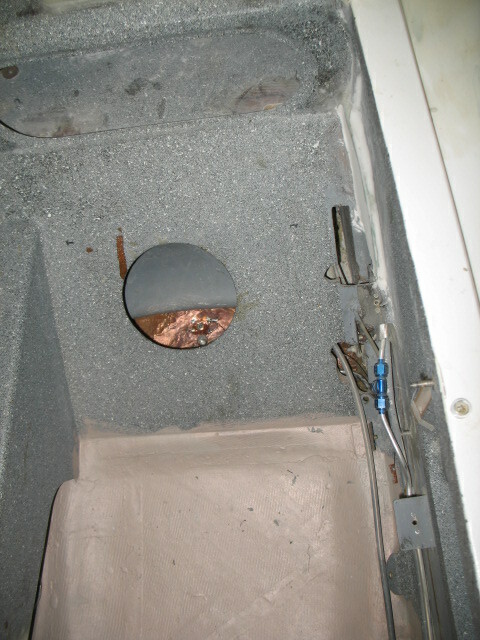 The book requires a minimum of four square feet (the copper is only about 1.5 ft sq). A ground wire was installed to connect the copper to the copper paint on the bottom the plane. 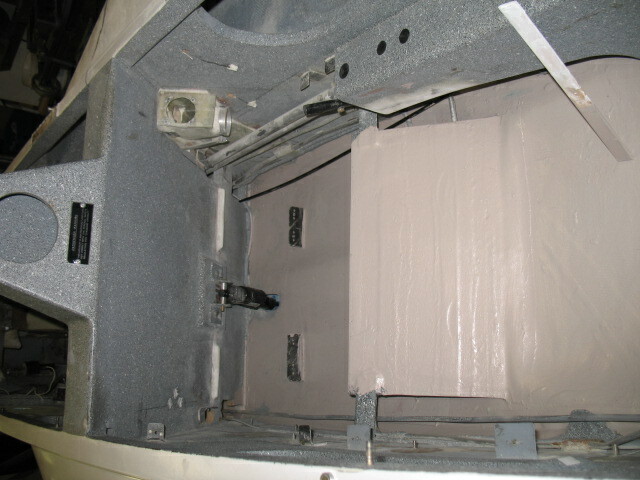 Ppod should have the equivalent ground plane of a standard aluminum plane (at least 14 ft sq in this case). 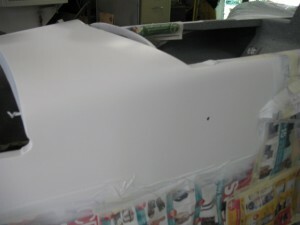 It took me at least a full day to take all the parts out of the plane and tape it off for painting. I’ll weigh EVERYTHING that goes back into the plane for my records. 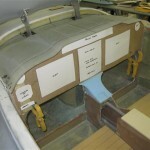 Should be interseting to see how much the “extras” add to the base weight of the plane. I am not overly worried about over spray on the plane since it will be stripped completely and repainted immediately after arrival in CA. 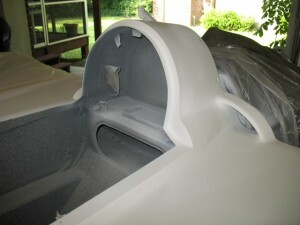 I like the change of look of the plane in epoxy gray. Finished in white sandable primer…. I really like the look of NO access door. It is now 10:40 and time to cool off in the pool. 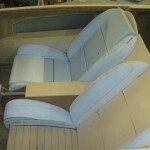 Next up is painting the interior, the real challenge. It will have to wait until Monday when the temps are a bit cooler. I am wasted…. Today the ADS-B antenna installation was finalized. 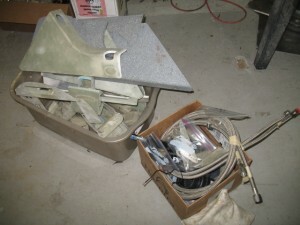 Installation requires two things…. 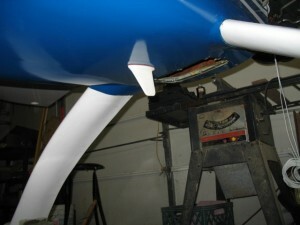 a ground plane (done) and somehow attaching the antenna to the fuselage. It finally occurred to me, I didnt need to dish out the 1″ thick interior foam to fit the 1/2″ long antenna studs, I just extended the studs with some threaded brass bushing made on the lath. This made installation MUCH easier as I now can easily access the nuts without cutting up the interior. I talked to the manufacture of the CuPro-CoteTM paint. He said others have used it for ground planes and it works great. If you plan to use it, paint it in THIN layers since excess acrylic binder (if you paint it thick) actually reduced the conductivity. 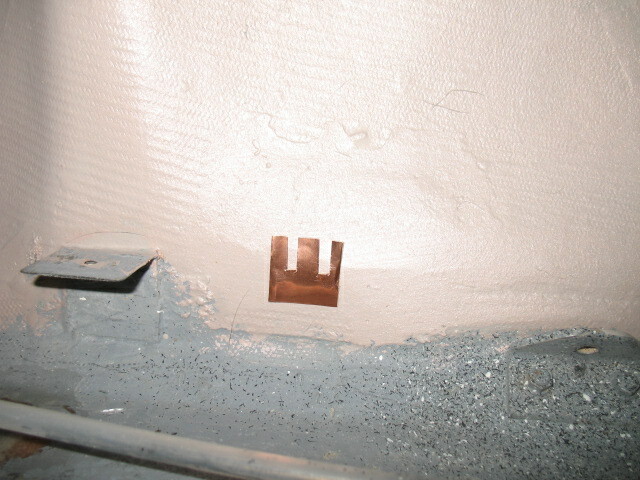 Five patchs of copper tape was cut in a sort of “E” so there would be more edge surface contact area for the paint and attached to the bottom. Then the entire surface was given a second coat with part of the tap left unpainted so a wire could be soldered to the tab the then covered with a patch of BID for protection. 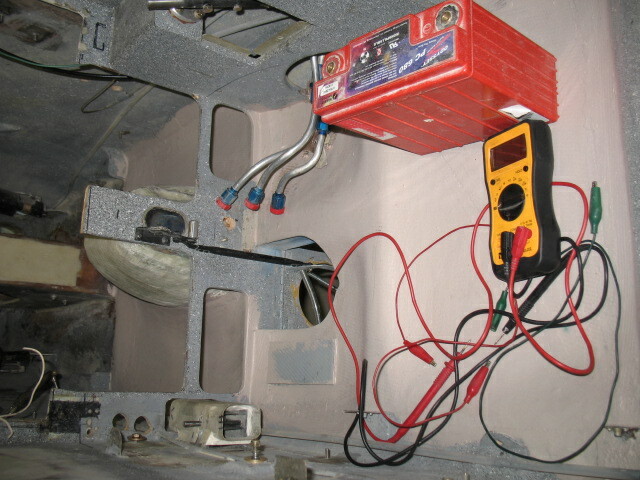 I don’t know if I need the extra wire connecting the sections as the resistance of the surface after a second coat of paint from the hell hole to the nose (about 7 ft”) was only 8 ohms. Ppod needed some additional “ground planes” which are used for making the antennas work properly. 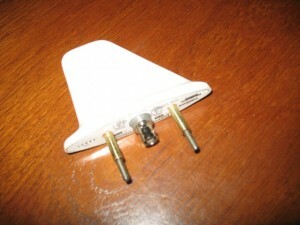 Some antennas need large ground planes to work such as the transponder and ADS-b antennas. Since I am adding new antenna (the ADS-B) and there is not enough much room in the plane for the size recommended. In my plane I had to compromise with smaller ground planes or really odd shaped ones (such as for my lightening detector). A few years ago, I found some electrically conductive paint which was used in my plane for reducing electrical noise (as shielding). 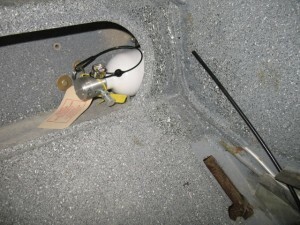 Ken Miller apparently used a conductive paint successfully for the transponder antenna he installed and since ATC reported no problems picking up the transponder signal, it was decided to just make the area much bigger. 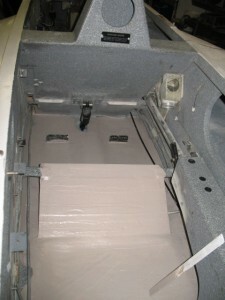 The entire bottom of the passenger area was painted with this stuff. 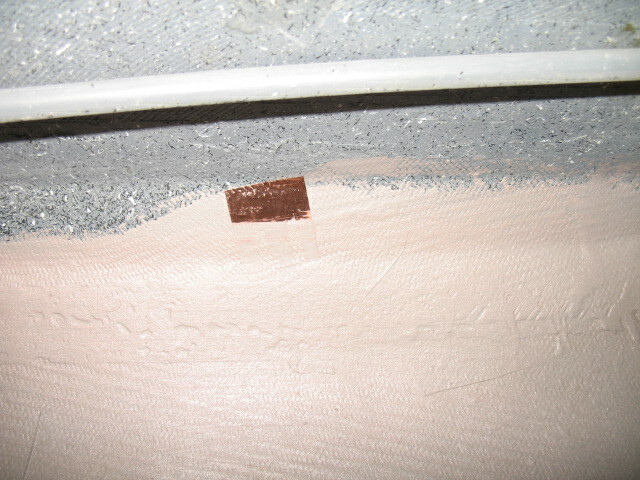 After drying, I tested the resistance of the paint and found it amazingly conductive. 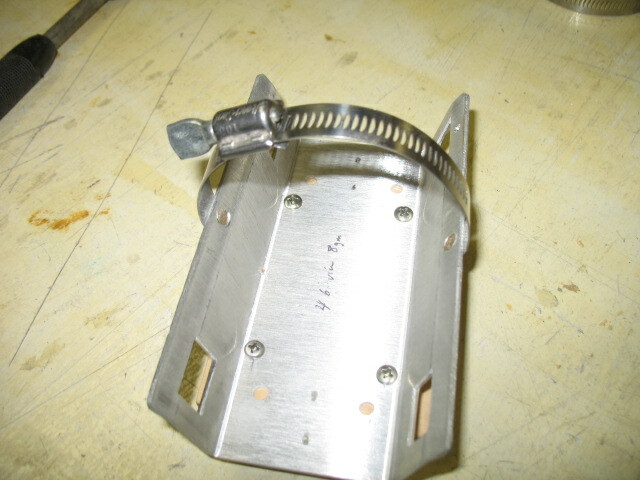 It reads 17 ohms across the fuselage (about 18″). 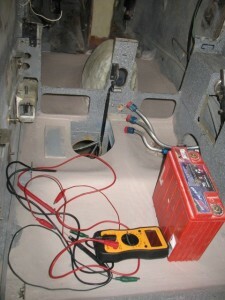 When tested it with a 12v source, it did not loose .01 volts from front to back of the plane! I also plan to attach some small copper tape (about 1/2″ sq) to the one side every 12″ and solder a wire on each tab to ground. It will be interesting to see how this new system works in flight with ATC. I hope this works well I can use this technique in future planes! **NOTE: I used this technique to “enlarge” the ground plane in my LongEZ. I can now report NO more problems with ATC picking up my transponder. It is working better than ever! 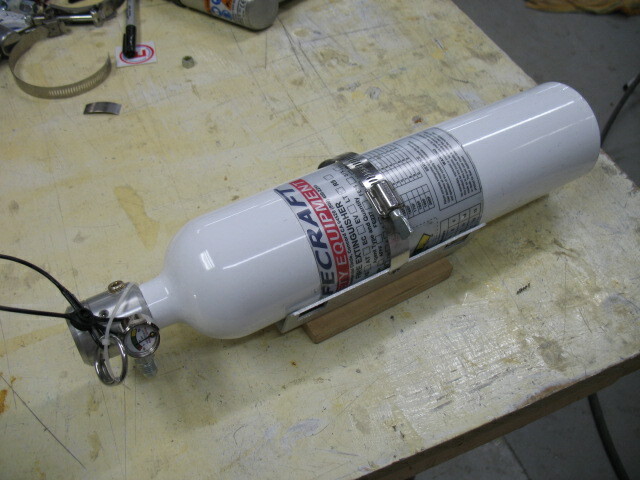 The fire system bottle was installed today. 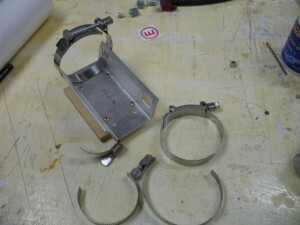 I replaced the 2 ea stock bottle holders (47 g ea) with a riveted hose (6 gm) hose clamp with a finger actuator. 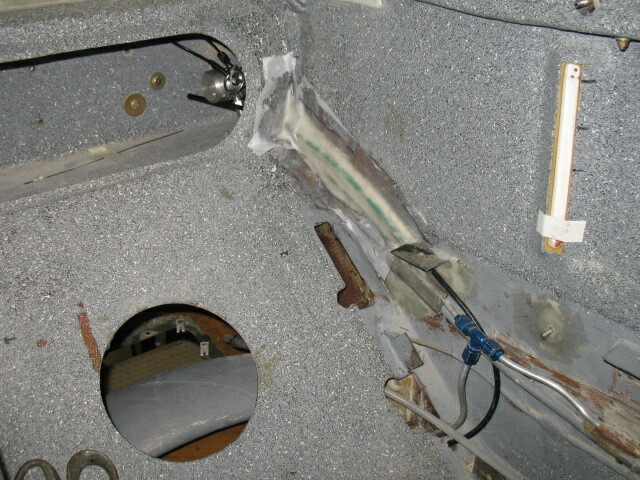 You will have to stick your arm way up the spar to tighten the wing bolt and was concerned about interference with the stock clamps. 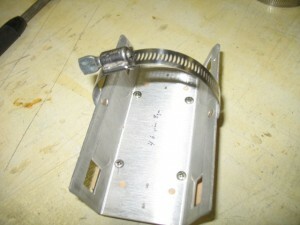 The hose clamp can swivel out of the way, and overall I saved 96g (3 oz) with the mod. The additional cable installation for the fire system was micro’d so it will be less noticable when finsished out. Today we had a very strong thunderstorm after I went flying. It was easy to see on the XM weather in the plane and my lightening detector was showed significant activity. 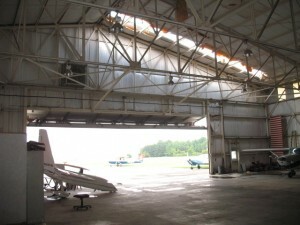 This evening, the club manager called and I found out part of the roof of the hanger had blown off. After checking my plane over, all is well. Base maintenance should be fixing in the next few days. 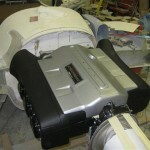 Updated pictures of the Boeing 787 Dreamline plant. 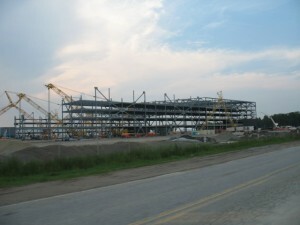 They are making amazing progress on it. The contractor has now started on moving a 2 mile road 500 feet to the south to enlarge the manufacturing site. 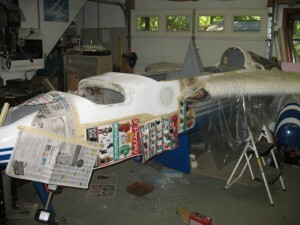 Jack Morrison sent me these pictures of his new plane he is building after a fire distroyed his beautiful E-Racer. 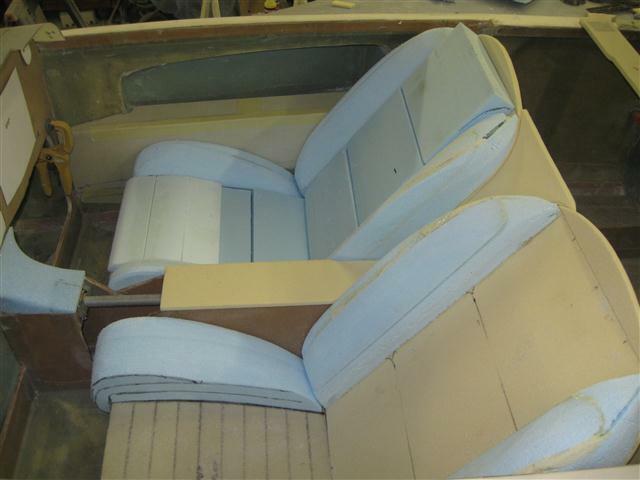 Again, his workmanship and creativity is cutting edge…. What a craftsman! Most of today was spent researching, planning and ordering materials for the “blended winglet” modification I want to do on the wings. What is it? 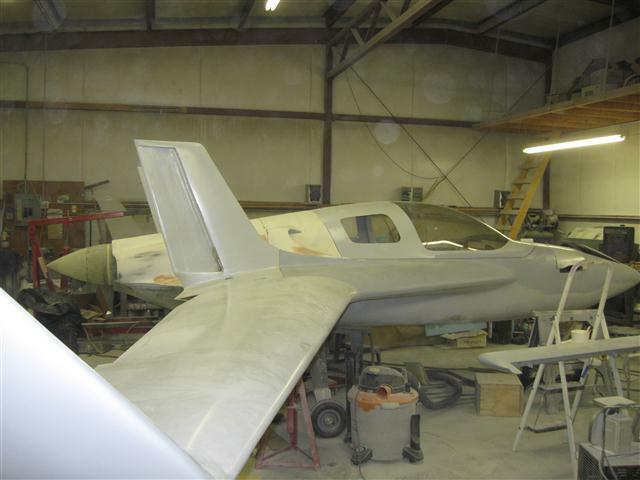 The blended winglet design was first introduced to the canard community by Jack Morrision on his E-Racer about 3 yrs ago. A beautiful plane which was later destroyed in a fire. 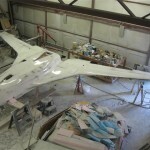 Jack is working on a new plane which looks just as incredible! His a very innovative guy! 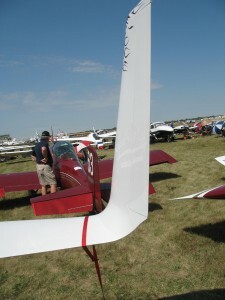 The blended winglet is the latest “craze” in the canard community. Once you see on on a plane, you’ll know why and will have to have on. The interesting thing I found out from the ordering/research, is that if you were building new wings from scratch the blended winglet would only add about $50 or so to the cost of each new wing. 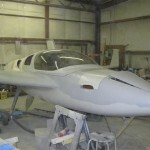 It makes the wings look much sleeker, reduces drag, and provides a real and permanent speed improvement. 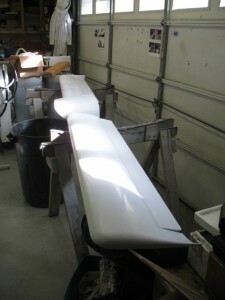 In a retrofit situation, the rebuild will cost around $250 or so (less epoxy) per wing. As I proceed into this phase of the project, I’ll refine the numbers for a more accurate cost of the mod. I spent some time working on the fire suppression system. Had to scratch my head a few time on exactly how it was to be done. As usual, I give myself a seemingly impossible challenges for which in the most part can eventually be worked out. 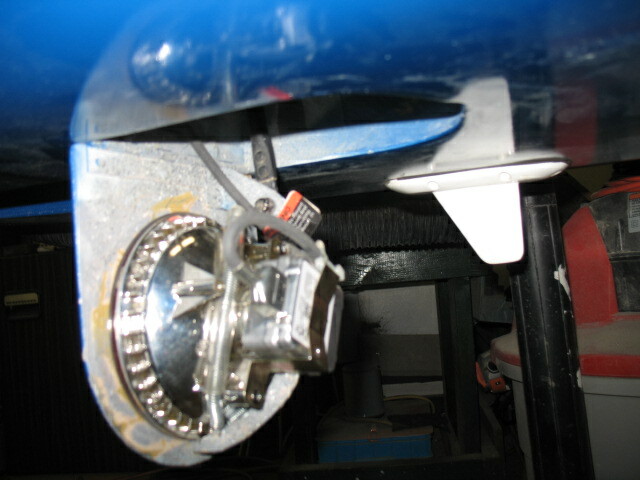 After an hour or so of fitting, I was able to solve the problems such as routing of the discharge line, activation cable, mounting, having access to the spar wing bolts, viewing the tank level, etc. The bottle will limit the storage capacity of the spar area, but if I need more baggage space for a trip, I can put on some of beautiful carbon graphite baggage pods P1 Cmposites is now building. 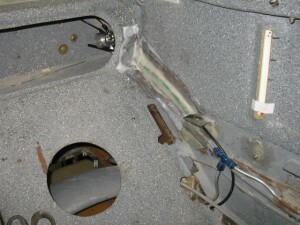 The cable is routed through a soda straw to allow it to be removed. I need to go the movies shortly as I find they have the best straws for glass work. I usually grab 3 or 4 at a time. The straws are really long and have a large diameter t0 guzzle down those super sized drinks you have to mortgage the house to buy (along with the popcorn). 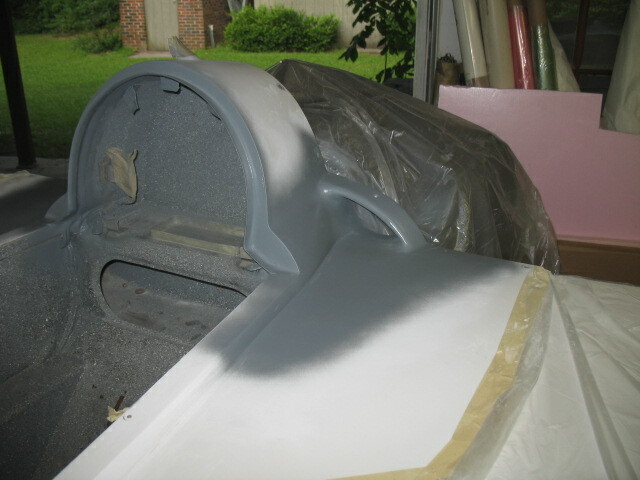 After the plane work I tested out the next phase of my grease car project. The filter system I made out of some bag type filters I purchased at Duda Diesel. Buying this kind of filter (bag type) is much cheaper than buying cartridge type filters. For this test I have a 1 micron filter (size of bacteria) which is smaller than the 10 micron filter in the car. Worked great! I am finding I hate the filter and pump stuff in the shop. The next step is to buy 2 plastic 50 gal drums ($20 ea) and install a underground pipe line from the front driveway to the back shed (the pipe is free) and move all the filter/storage crap to my shed. I’ll have to disassemble my cart, but I can reuse all the hardware. Then I’ll just pump the dirty oil from the drum in the truck (via the pipeline) to the shed , filter it, store it, then pump the clean oil back to my driveway (via the same pipeline) and into the car. Clean, neat and out of sight when not needed. Sweet. This afternoon while emailing DURING A THUNDERSTORM, my computer crashed…. Big time crashed. I know, you have always been told turn off all your electrical stuff during a storm. I THOUGHT I was protected with a UPS and an isolated system, but no, a big crack of lightening, computer crashed and next thing I know there was the “Hard disk not found” during boot up. Yikes! As recommended I had made a “Recovery Disk” (imagine that) when I installed the operating system and as annoying as the daily backup is (slowing down the computer) for some reason, I had let it run to completion this morning. I booted up on the recovery disk, had to do a complete re-image of the computer “C” hard drive (from this morning’s back up) and wala! the computer is working perfectly again. I keep all my data on the “D” drive (a second drive) so I didnt lose a single file. Windows 7 is terrific in my book! Now I just need to turn off my computer during the next storm. I had the fuel caps engraved. Actually they look very cool. 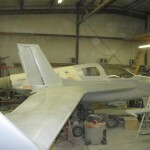 I’ll paint the lettering a suitable color when the plane is painted the plane in Calif. Polished up and lettered I am sure they will look great! 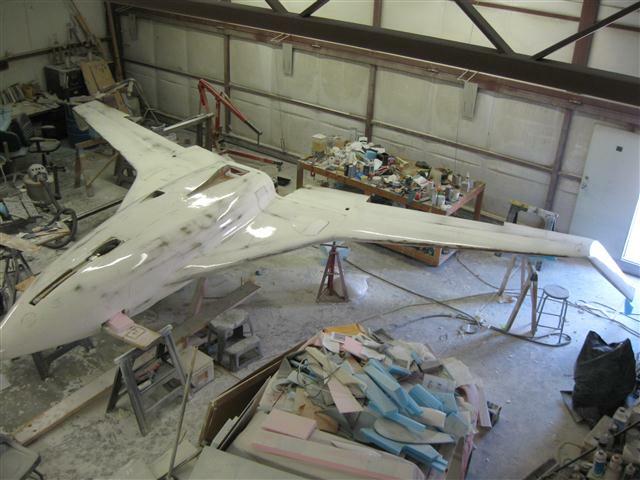 Disassembly of the plane to prepare it for painting continued today. 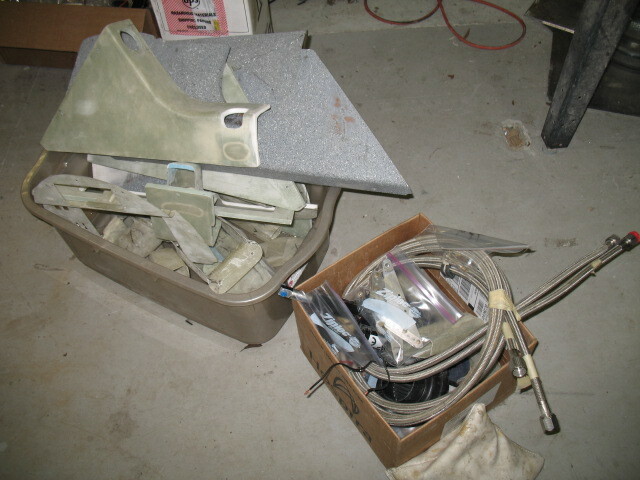 I have a huge pile of parts now. I want to weigh everything added to the plane (such as the heating system) to see how much my work affected the weight of the plane. 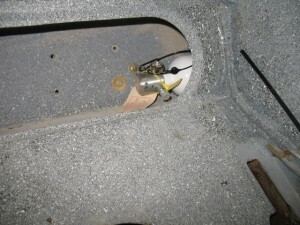 The HID landing light installation gave me a bit of trouble. At first, I didnt think it could be installed. The HID bulb is much taller and a little larger in diameter by 0.015″. 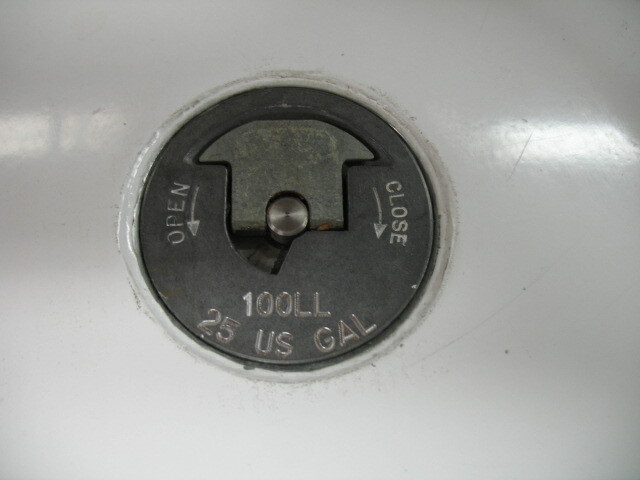 Doesn’t seem like much but the bulb would not sit flush to the bracket . 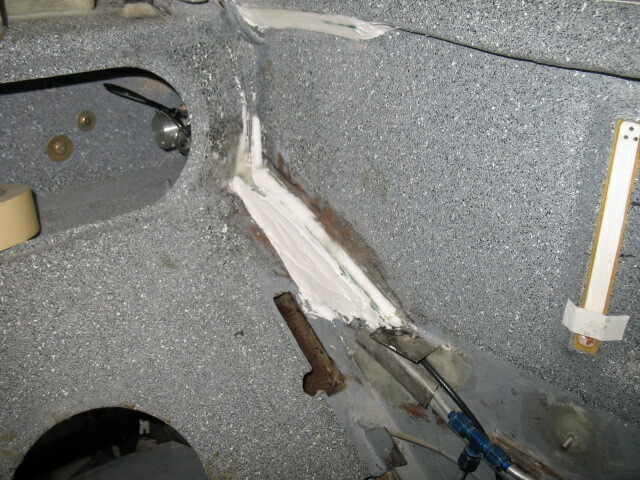 Careful, extensive filing and bending of the aft brace bracket was required to get it installed. 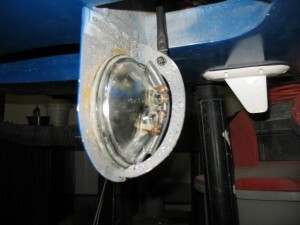 The HID light is incredibly bright and requires much less power than the standard 150 watt ligth that was installed. Installation of the Halon fire suppression system was stared. 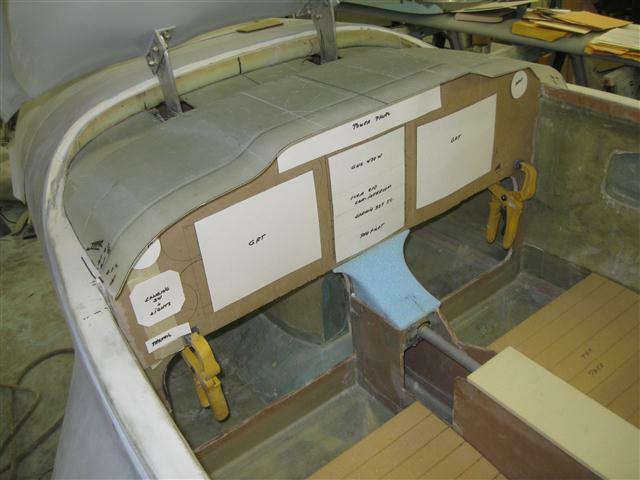 If a fire is sensed in the engine compartment (there will be an alarm on the EFIS), the pilot can pull a handle on the dash which will flood the engine compartment with halon and quickly put out any potential fire. I had a little time during the week or so of not working on the plane to work on some fun projects. I finished a roll around fueling station for my waste oil car. 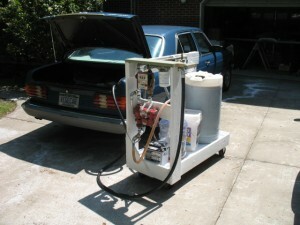 It is a complete system for pumping/filtering waste oil for the car. I have already come up with another plan to pump the oil from the drive way to a shed, filter it, and pump it back to the driveway for distribution. 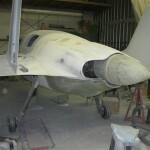 This part of the project will have to wait until after the plane is completed. 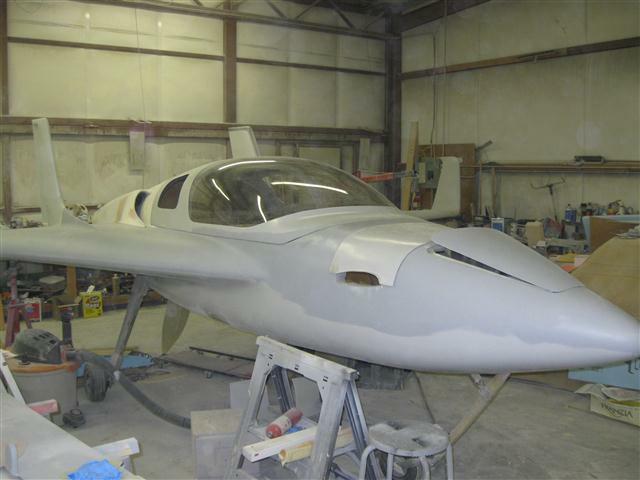 The canard is painted, balanced and assembled. Ready to install. 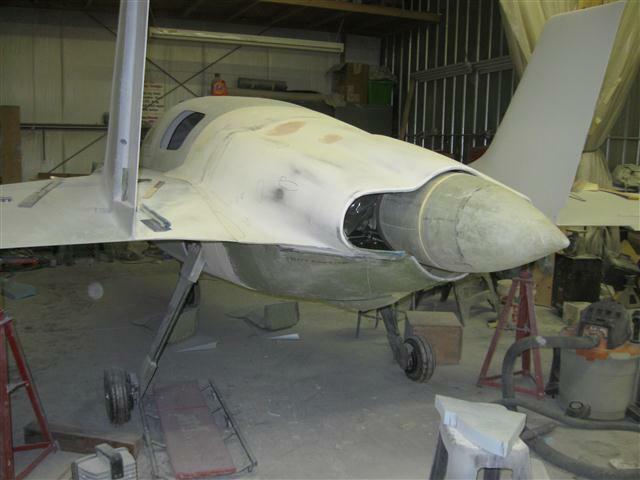 I am now working on the fuselage removing all interior components to prepare for painting on the exterior and interior of the plane. 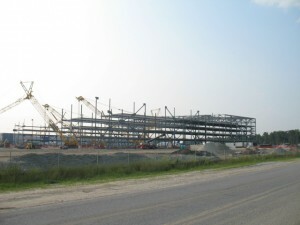 I thought you might like to see the work progress on the new Boeing 787 Dreamline plant being built at our airport. 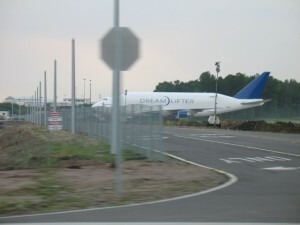 You can see two DreamLifters (converted 747’s) parked on the ramp which are used to carry components of the new plane to and from Charleston. Eventually the entire plane will be built here. 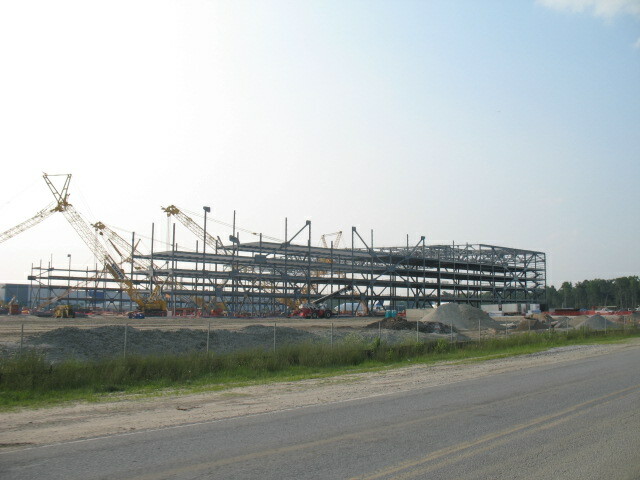 HUGE hangers/work areas are being built to assemble the planes. 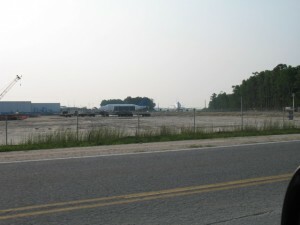 They are even moving the airport perimeter road to accommodate the construction. 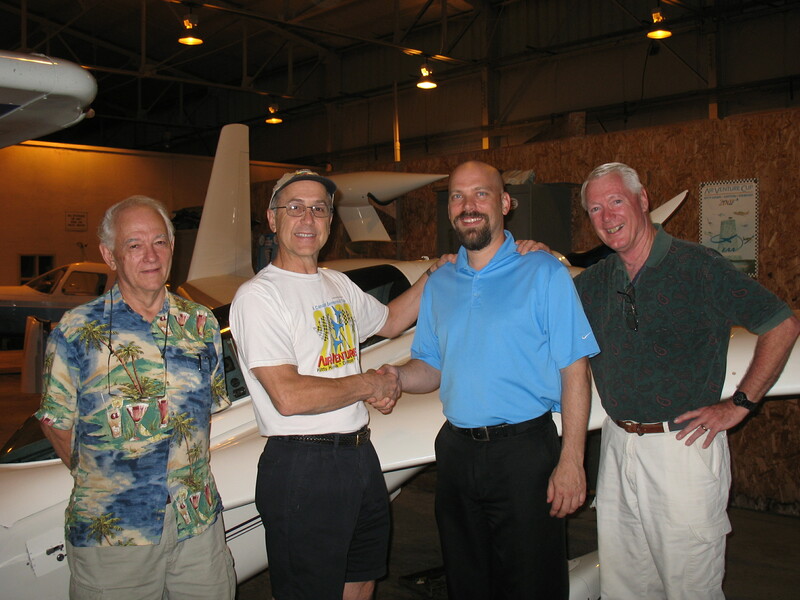 At our latest EAA meeting this week, we welcomed a new canard owner to Charleston. There are now 5 builder/fliers in the area. 3 longez’s and 2 cozy’s. 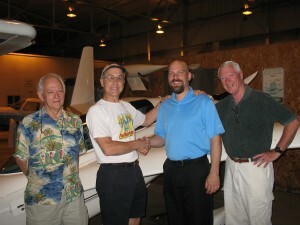 Ed (the pilot in blue) recently flew his plane from Washington state to Charleston. He had lots of problems and adventures on the trip and his presentation was most entertaining. I ended up missing a Spoleto performance which turned to be one of the most talked about show of the season. Jack Wilhelmson (cozy 3), Me, Ed Hensel (longez), and Glen Phelps (cozy 4), unfortunately Tony Cole (longe ez) was out of town for this picture. Wow, Spoleto has come to an end already. I had a wonderful opportunity to see a lot of great shows. Tonight my finale was a ballet “Giselle” performed by the National Ballet of Georgia. It was excellent! Here is some things I noticed tonight. First there were a lot of really tall people at the performance. Most of the time I am about average in height to those around me, but tonight I was really felt out of place. Lot of patrons were towering over me. Now I know how Dr. Ruth feels. For some strange reaion, there were also lots of ladies at the show, and the average age was much less than at the Beethoven concert. Young, good looking, tall people go to ballets… interesting. I think the reason all the young gals were at this performance was to check out the dancers. I dont think the male dances know what a “cup” is or maybe they dont even wear underwear beneath there VERY tight and revealing tights. Talk about tight buns and packages. It was hard for me to watch some of the dances without doing some quantifable comparison checking. I an’t got nothing to worry about for sure…. Of coarse the male lead dancer seemed to have a the largest well anoyance. Hum, maybe when you are the male lead, you can stuff more junk down the front of your pants to impress the tall young gals. Anyway, for the second half I sat up in the balcony, a little further from the stage and really enjoyed the show with a few less distractions. What I found most interesting was how the performance seemly like a silent move. I did not ready the program before the show, so I had no idea what the first act was about. Through the music, pantomiming on stage and facial expression, I basiclly knew what was going on and upon reading the program during intermission, I was right on. It was fun and I really enjoy it ..with the exception of the guy thing…. I heard the most fantastic acoustic jazz guitarist tonight. Julian Lage is only 21 years old and it the “official guitarist” of Spoleto and Grammy nominated and I can see why. He was on stage with one of his band member, an acoustic bass player who in my opinion was equally as good. I was fascinated by how the bassist would play cords, pluck the string, slap them and produce wonderful sounds I couldn’t imagine coming from this instrument. The performers really had a great time on stage, lots of energy and amazing playing…. Most excellent! Tonights performance was at Gaillard for a symphony. Featured was Beethoven, Mozart and Wagner. It was a great performace! I espeically like the sympyhony #8 by Beethoven as it is not one of his more famous one (like the 7th) and not played as often. Very good.